Start the builder by typing pqsmol at the command prompt. As shown in Figure , the whole molecule consists of 4 atoms, with the tetrahedral carbon in the center. We will start with this carbon. Insert the tetrahedral carbon building block. When PQSMOL is first started, the default current element is carbon. 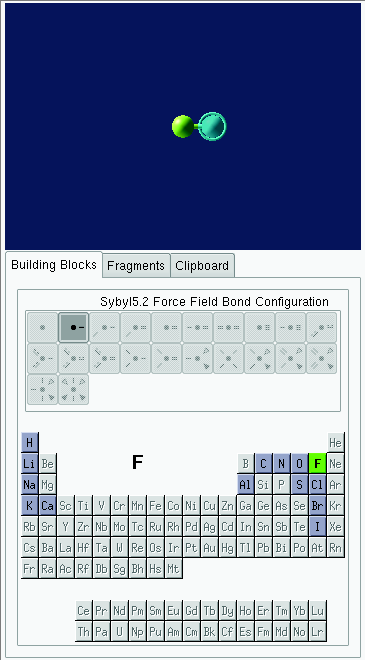 The current element is displayed in large font above the periodic table in the Segment window and the current element's button is highlighted with a green background. There may be multiple building blocks available for a given element. These are listed in the Bond Configuration frame. The default building block for carbon is the tetrahedral block. The current building block is displayed in the Segment buffer. At this point we should have the correct building block ready to insert into the Build window. The Segment window should look like the one in Figure . To insert the building block, first select the Add/Attach/Connect tool from the toolbar at the bottom of the window and click anywhere inside the build area. Tip: You may also insert into the Build window using the Default tool by right-clicking in the Build window. 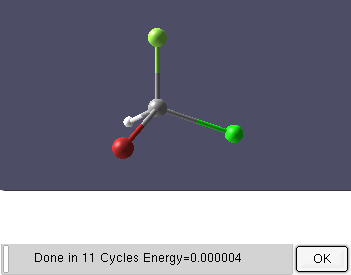 Note: If for some reason the building block in your Segment window is different than the one in Figure , you can select the tetrahedral carbon building block by clicking on the carbon button in the periodic table. Figure shows the Build window with the tetrahedral carbon inserted. Connect the fluorine building block. In the Segment window press the fluorine button in the periodic table. There is only one building block available for fluorine. Your Segment window should now be identical to the one in Figure . Using the same Add/Attach/Connect tool move the mouse over the top-most dummy atom in the build area. The dummy atom will be highlighted with a circle around it. The mouse pointer will change to a plus sign with a letter "A", as shown in the left image of Figure . This indicates that the dummy atom is a valid attachment point for the segment in the Segment buffer. Click the mouse button over the atom. The result is shown in the right image of Figure . Connect the Chlorine building block. Select Chlorine in the periodic table. Again for Chlorine only one building block is available. 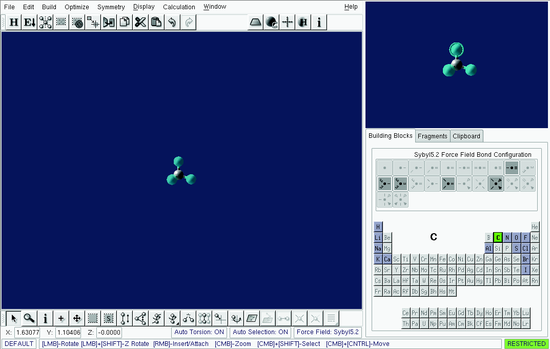 Using the Add/Attach/Connect tool attach the Chlorine building block to the right-most dummy atom, as shown in Figure . Connect the Bromine building block. Select Bromine in the periodic table. Again for Bromine only one building block is available. Using the Add/Attach/Connect tool attach the Bromine building block to the left-front dummy atom. Fill dummy atoms with hydrogen. to replace all remaining single-bond dummy atoms with hydrogen. In our case, we only have one such dummy atom. PQSMOL has the capability to perform an initial geometry optimization using one of two built-in force fields. The default force field is Sybyl5.2 (this can be seen in the status bar at the bottom of the Build window in Figure ) which is perfectly adequate for this example. button in the top toolbar. Figure shows the result. button to close the geometry optimization dialog. 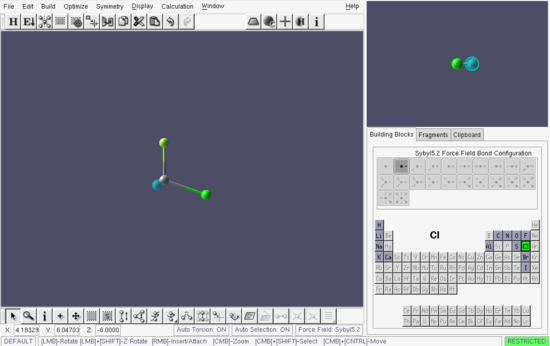 The symmetrizer in PQSMOL is initiated via the Check Symmetry button in the top toolbar. This operation attempts to find any axes of symmetry in the built structure, within a specified threshold. If any symmetry is found, the atoms are repositioned to conform exactly with the found symmetry. 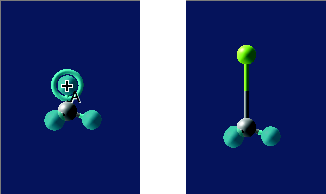 Our example molecule has "c1" symmetry i.e., no detected symmetry, as shown in Figure .